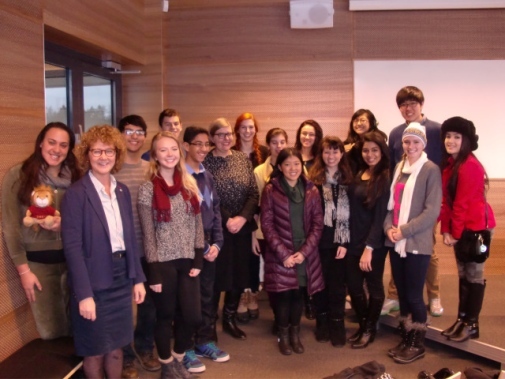 This week, Nobel Week, sees Stockholm University hosting 20 young people from NSHSS, the National Society of High School Scholars from Canada, Namibia, South Korea and the United States, who are visiting the University for three days to be inspired by the Nobel festivities. NSHSS was originally founded by Claes Nobel, a cousin of Alfred Nobel but long resident in the United States. The aim of the organisation is for young people to cultivate academic interests to build a better world - and where can you imagine a better source of inspiration for this than in Stockholm during the Nobel Week? The students have been in the Aula Magna and listened to the Nobel Laureates in physics, chemistry and economics and met the Stockholm University professors who sit on the Nobel Committees. We look forward to welcoming some of those students to our study programmes in the future!